First I was a Brownie, then a Girl Scout through eighth grade. I had excellent leaders and made happy memories during my time in the Scouting ranks. I earned my fair share of badges and gained prowess in many areas. 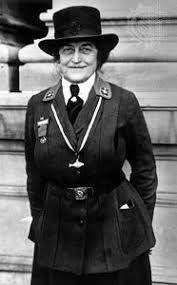 Founded in March 1912 by Juliette Gordon Low, the organization’s mission was to build character through community service, outdoor activities, and homemaking skills. 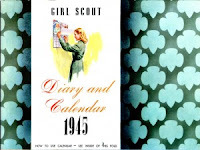 With service being an integral part of the Girl Scout’s credo, they were active in myriad ways on the World War II home front. Like most Americans, the girls created Victory gardens, collected scrap metal and fat, and sold war bonds. However, they also collected over one million articles of clothing for refugees, and some of the girls worked as farm aides while others served as bicycle couriers. In 1942, the Senior-level girls started a hospital aide program. Tasks included performing clerical work, assisting patients with eating, and making beds. Another interesting project they were responsible for was the Defense Institute that was geared toward teaching survival skills and ways to comfort children during possible air raids. 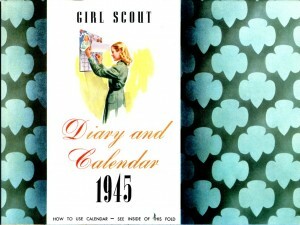 With rationing in full force by 1944, the Girl Scouts set aside their famous cookies to sell calendars. Also mindful of the shortage of fabric and sewing notions, the uniform was changed from a zippered bodice to one that buttoned. In honor of the group’s founder, the one hundred and first Liberty ship was given the name S.S. Juliette Low and launched in Savannah, GA on May 12, 1944. Christened by Ms. Low’s niece Margaret Gordon, the ship was operated by the South Atlantic Steamship Line and carried cargo for the British, Lend Lease, and U.S. Army in nearly all wartime theaters of operation. Ms. Low would no doubt be pleased to know the ship served with distinction until being scuttled in 1972. Were you ever part of the Scouts or other girl’s organization? I am enjoying your War posts. The thing I love about WWII (if love is the word, and I think it probably isn't), is that EVERYONE sacrificed on some level. Saw Ken Burns' "The War" this fall and was so impressed by what happened on the homefront. Had lunch with Clarice today> Good luck tomorrow. I agree about appreciating the level of sacrifice and commitment. It was an amazing time. Glad you are enjoying the posts. I've started moderating posts. I got some trolls.